The process of problem solving can seem like an overwhelming one. There are so many different approaches to take when it comes to finding solutions to life's struggles and obstacles. Breaking it all down and managing things can be tough. The act of keeping a journal can truly become your most valuable problem-solving tool. Having resources like this to help you along the process can make things seem much more seamless. Whether you're working in a group or on your own, a journal can be a great resource to help in every aspect of your life, especially when it comes to problem solving. 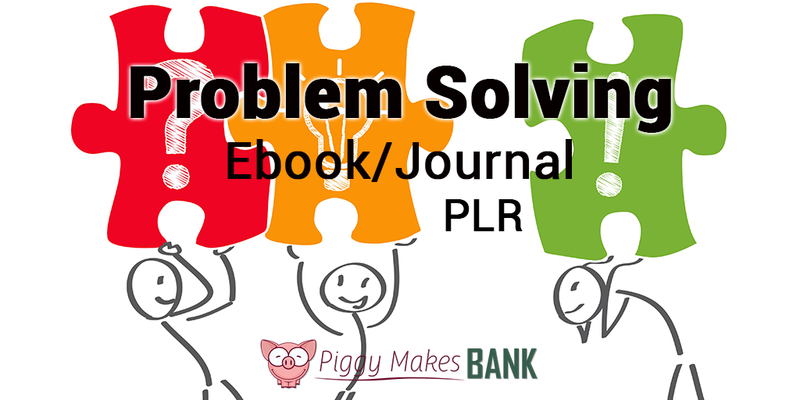 Show your readers how no matter what types of problems they may have on their plate, using a journal can help them to manage anything with this eBook / Journal combo. This ebook would make a great info product that you can promote to your audience. It would be a perfect addition to the 30 Days of Problem Solving Challenge pack we offer, but works just as well as a standalone product. Edit it slightly as needed to fit your audience and your style, and you can have a brand new eBook up and ready for sale over the course of a day or two. Or take the content and use it to create a class or coaching program on the topic. Of course you can also break the content apart and use it as you see fit. Break it down into three shorter reports to use as lead magnets, or create a long series of blog posts. No matter how you decide to use the content, your readers will appreciate this information on better problem solving. You may have heard that it takes 30 days to create a habit and with this journal you can help your readers. There are 30+ pages that will help record thoughts and progress as your audience begins to journal to help them problem solve issues in their personal and/or daily lives. If you want to help your readers learn how to become better problem solvers, you can get this incredibly value-packed bundle for only $47. That’s way less than you’d pay a quality ghostwriter to write just a couple of articles for you.